For residential or commercial lawn mowing services in Blackburn, Victoria, look no further than Acre Lawns. With years of industry experience and consistently satisfactory service, our brand has become synonymous with beautifully maintained lawns and gardens. Every lawn is unique and as such will also require unique care to ensure its health. Lawns need to be trimmed to the optimal height, otherwise the grass will not grow as expected. Proper lawn care equipment should also be used to ensure that the job will be done the right way. By enlisting our services, you are entrusting your lawn to the hands of experts with access to all the equipment required to the carry out the job with utmost efficiency. Our team of mowing, slashing and garden maintenance staff is experienced, reliable and highly professional. 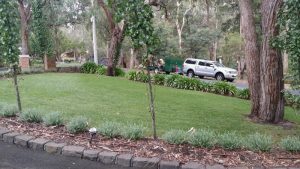 We offer worry-free lawn mowing and related gardening services to residential and commercial customers in Blackburn, Blackburn North, Blackburn South and surrounding suburbs in Melbourne’s East. We’re experts at maintaining grounds of all sizes, from private backyards to schools, estates and body corps, parks and reserves. At Acre Lawns, we go out of our way to keep our customers happy. And we’ll gladly add your one-time or regular mowing job to our schedule. Why not give us a call now and get a FREE quote? Blackburn (population 12,796 in 2011), is located about 16 km east of the CBD of Victoria’s capital city and covers an area of 5.8 km2. It is governed by Whitehorse City Council. Blackburn is one of the major suburbs in Melbourne’s East where Acre Lawns maintains gardens and mows lawns. For information about zoning, planning, building, land use, subdividing, pruning, tree removal, various permissions and more, refer to Whitehorse Council Planning section’s Frequently Asked Questions. Blackburn is part of the Yarra Valley Water District. For local regulations regarding watering, hosing, washing, filling pools, spas, fountains and water features, check these Permanent Water Use Rules for residential and commercial gardens and lawns. Want to know more? Here are further details about our lawn mowing services, ride-on mowing and garden maintenance services.